If you have ever chopped or split wood at any time, you know that this can be an arduous, time consuming and thankless task which is not a lot of fun. Not only does this activity take a great deal of strength and technique, but it can also be somewhat dangerous for those who are not very proficient with an axe. Also, splitting wood outdoors during frigid winter days is also something which adds to the difficulty of the project. Sure, we all love the warmth, sight, and smell of a fireplace, but are we willing to pay the price for it? Are we all capable and prepared to do the hard work involved in continuously feeding the fire with wood to keep it going? If you are older, or just strapped for time, chopping wood is probably not at the top of your list of favorite activities. Let’s just say we do not all have the exceptional lumberjack skills or strength of Paul Bunyan. For this reason, there must be an easier way to enjoy your beautiful fireplace. If you need to chop wood often for your fireplace, cast iron stove or other uses, you should look into a machine which will make your life a whole lot easier. 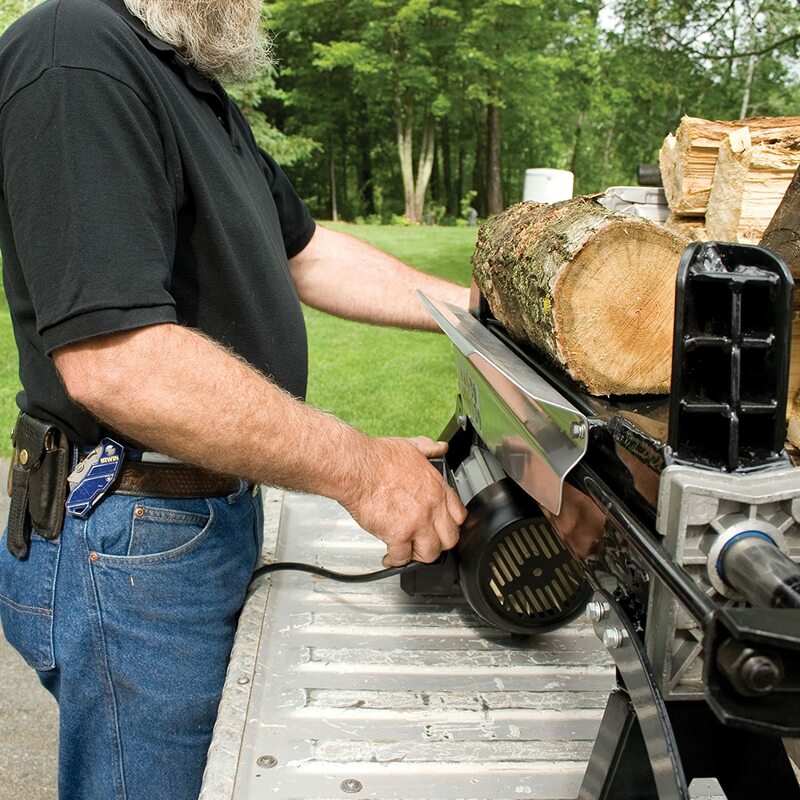 The proper wood splitter will save you effort and time and will do the job safely for you. Once you have this unit, you will wonder how you lived without one. 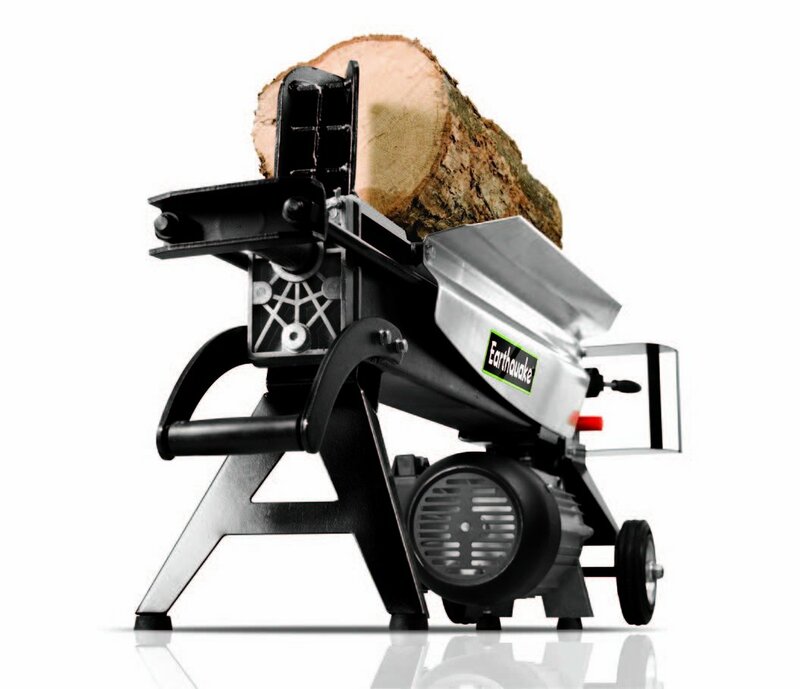 For many reasons which we will cover within this review, the Earthquake w1200 Compact 5-Ton Electric Log Splitter is an ideal machine for your wood chopping projects. It is equipped with numerous features which will simplify your life, as you will be spending more time in front of the fireplace, instead of prepping it. 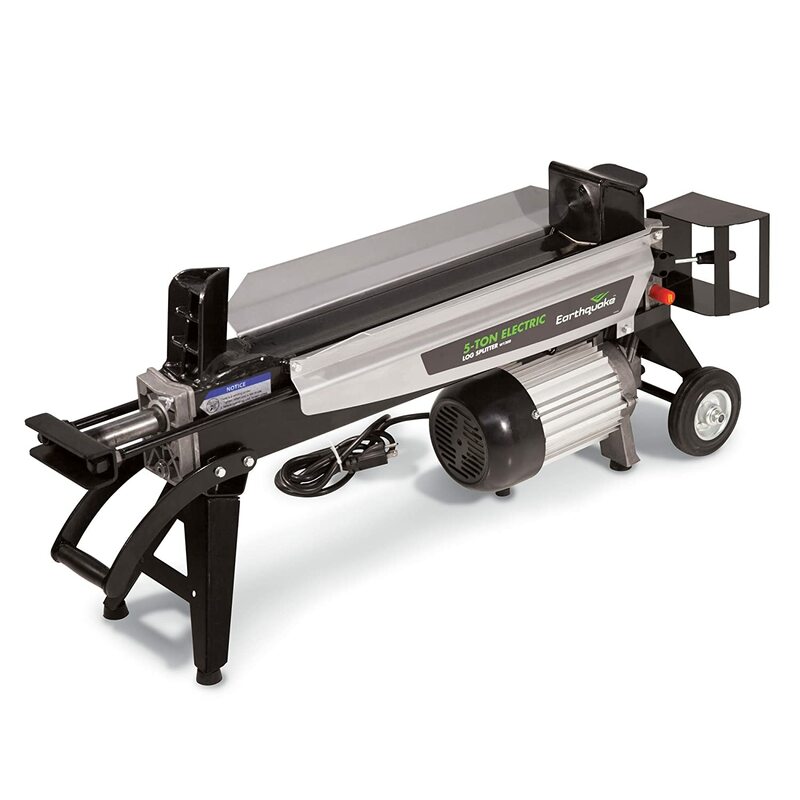 If you are looking to reduce the amount of time you spend preparing firewood drastically, then the Earthquake W1200 is the ideal machine for you. Equipped with a 1.75 HP electric motor with precision components and copper motor winding, it is backed by a 5-year warranty. Also, the electrical motor permits this machine to be utilized wherever there is an electrical outlet, including indoors. It cannot get any simpler than this since there is no gas, no oil and no pull string involved. The W1200 is a powerful unit which has a maximum splitting of up to five tons and can split logs which are up to 20 inches in length. The rubber coated handle and durable steel wheels allow this machine to be quickly moved around and used almost anywhere with an electrical outlet. It is a compact unit which can fit into a small shed or other workspaces you may have available. If you live in a location which is extremely cold during the winter, then you are aware of the difficulty involved in splitting or chopping wood in the freezing weather. With its well built and energy efficient electric motor, the Earthquake W1200 allows you to take your wood splitting duties indoors. You can now split wood in the comfort of your heated workshop or garage without having to strain yourself excessively. Another important aspect of the Earthquake W1200 is that it does not use petroleum, which pollutes the environment. The powerful 1.75 horsepower electric engine runs clean and is ideal if you are going green and are interested in reducing the burning of fossil fuels. You also save time by not having to purchase and fill it up with gas. As long as you have an electrical outlet nearby, you do not have to worry about it running out of gas and halting your work. Considering its formidable and time-saving features, the Earthquake W1200 is very affordably priced. Just think of the many hours it will save you every time you need to use it. Splitting wood in the comfort of your workspace is something which brings a great deal of value to your life in the woods. If you are looking to enjoy your time at your home and cut down on your tiring chores, the Earthquake W1200 Compact 5-Ton Electric Log Splitter may undoubtedly be the ideal machine for you. This extraordinarily mobile and compact unit is equipped with a powerful electric motor which can be taken and used virtually anywhere there is an electrical outlet available. A secondary benefit to the electrical motor is that, unlike gas units, it can be used indoors during the harsh winter weather, where you can split wood in the comfort of your heated workspace. The electric motor is also cleaner for the environment in that it does not burn any polluting fossil fuels. For a unit with such extensive features and benefits, the Earthquake W1200 is also very reasonably priced. Since it will be saving you a great deal of time on such a difficult chore, you will be getting your money’s worth every time you use it to split or chop wood. It is a powerful, reliable and well-built machine which will greatly assist in preparing your firewood, ensuring that you get the most enjoyment and utility out of your fireplace or any other wood-burning device. 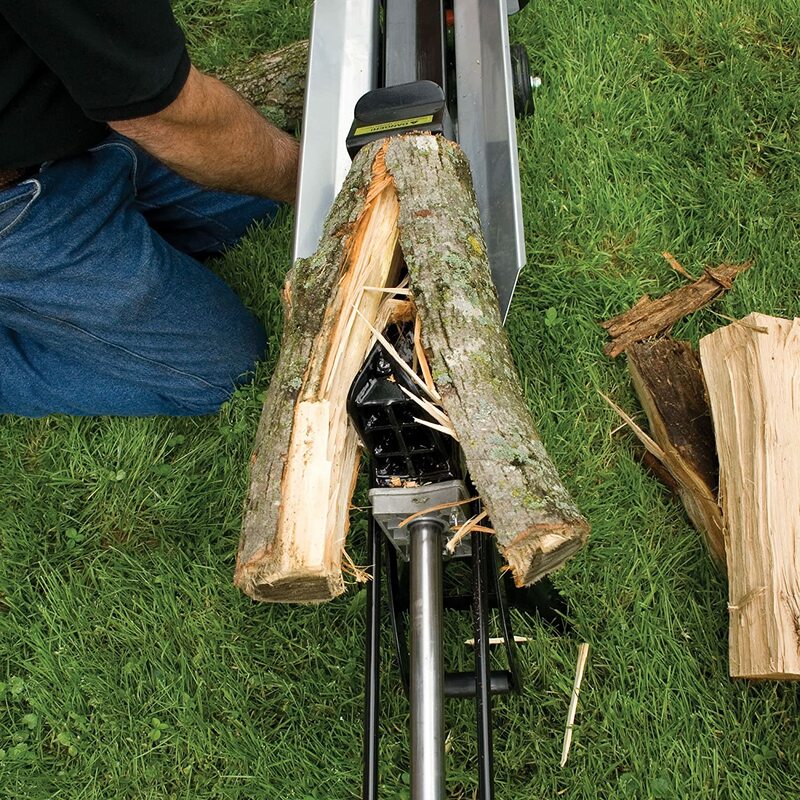 We hope that this review has helped you to find the right log splitter for your needs.